I'm not a big fan of doll cakes, but they're popular, especially for girls' birthdays, so I've had to make my fair share of them. 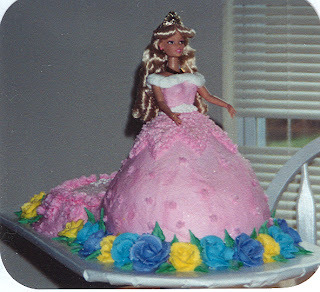 For anyone who doesn't know what I'm talking about, doll cakes are a Barbie-type doll on top of a dome-shaped cake that is decorated to look like the skirt of her dress. Usually the doll is just a pick--meaning only the waist and above on a plastic stick that's inserted into the top of the cake before decorating, but sometimes I've had to use an actual doll. 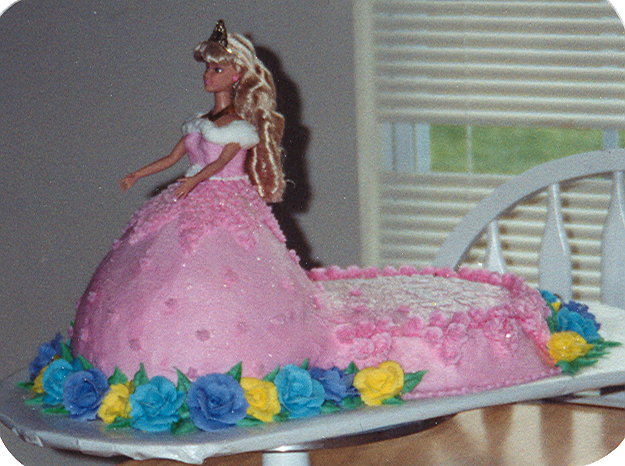 That's usually the case when the cake is meant to be a specific Barbie (like the Disney princesses). I don't like them because they're a pain. Baking a cake into a dress shape should be easy enough using a pudding basin or pan otherwise designed for that purpose, but with a cake that thick it's easy to burn the edges before the center is baked. Also, the bottom of the dress (wide end of the cake) has to be level or else the whole cake will look crooked. The doll needs to be centered, and that's a trick and a half if you're using a real doll with legs to contend with. The picks are much easier to work with, but then the birthday girl doesn't have a new Barbie doll to play with once the cake is served. So, for my inaugural Should've Done Sunday, I'm going to critique a Sleeping Beauty (I think that's who this is, right?) doll cake I made years ago for a little girl's birthday. Here she is. Most doll cakes will only serve 12, which won't be enough for big parties, and this little girl had a lot of friends. 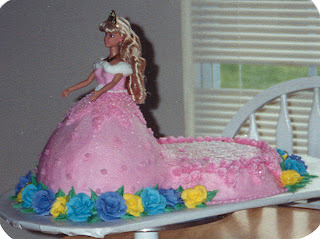 I tried to remedy this by putting the doll on a sheet cake with the idea of giving the dress a train (and the host more servings), but it didn't look right, even after I trimmed the sheet cake into more of a dress-train shape. Also, remember what I said about the doll needing to be centered? Well, this one isn't, and that's why it looks like she's leaning back. It's not easy to get the legs to go straight down the top of the cake, even when they're taped together and wrapped in saran wrap. I'm not sure what I was thinking with those roses, either. The mom must have requested flowers, but why did I put those clashing blue colors together? Plus, the scale is all wrong. I realize it's a cake, not a nature documentary, but oversized mutant flowers really have no place here. I seriously doubt Sleeping Beauty would be walking through a garden of ankle-high roses. Not in that dress, anyway. Explain to the customer that the cake she wants won't be sufficient to serve the number of guests and suggest she also have either cupcakes (decorated to match) or a separate sheet cake so there's enough for everybody. Instead of colossal roses, have a simple bead or ruffle border along the bottom so it looks like part of the dress. No clashing blue hues, ugh. Center the doll better--although, I honestly think I did the best I could at the time. It's not so obvious in the picture, but I really went overboard on the cake sparkles. In the actual photograph it's more noticeable, and Sleeping Beauty looks like she has a thick layer of dew all over her. So yeah, less edible glitter. Other than that, this cake is pretty decent. I have a few more doll cakes I'll share as and when the mood strikes me, but this one had the most issues. I would love to hear your ideas of how this cake should've been done, or any doll cake related experiences you'd like to share in the comments. Stopping by to say Hi from Bloggy Moms, I'm your newest follower and I like your doll cake! Very creative. I also like your idea of taking off the blue flowers and doing some beading. Hi, is this doll cake gluten free? My gf daughter wants a doll cake, and i'm wondering what gf cake batter works best for one of these pans. This cake was made from a mix years ago, so no, it wasn't gluten free. I don't think I would attempt a gluten free cake recipe in a doll pan. I'm just not sure it would bake very well. Rather, I would bake several 6"-8" round layers, stack them, then cut the sides to form the dress skirt shape. If you're using a real doll (as opposed to a doll pick), then you'll need to carve out a small hole straight through the layers to accommodate the doll's legs. Thank you for responding so quickly! That helps immensely. I was really concerned about attempting a gf cake in a doll pan. This seems like a much better option!